American Football is probably on par with watching the grass grow (for me anywhere) but ironically there have been some very interesting and entertaining movies revolving around this popular American sport. 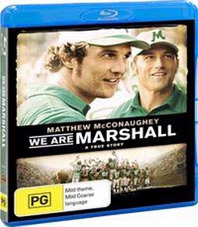 From Any Given Sunday to We are Giants, We Are Marshall is another gem to land on Blu-ray and to lend some credibility to the film, it's based on a true story, albeit very sad. Set during the 70's, this story revolves around an unthinkable incident for the small country town of Huntington West Virginia where its entire college football team, including staff, coaches and fans were killed in a plane crash. With the entire town of Huntington in shock, We Are Marshall is the powerful drama that tells how this town came together, thanks to one inspirational man called Jack Lengyel (Matthew McConaughey) who decided to rebuild the football team of Marshall University, the Thundering Heard from its ashes. For this young coach, the adversity is unparalleled yet somehow he overcame the adversity and not only did he help rebuild the town but also its spirit which many believed would never return from this horrific event. Even though at times, We Are Marshall is clichéd and really works on your heart strings, McConaughey successfully manages to portray this inexperienced coach who helps turn this tragedy into a victory for the town of Huntington. Joining McConaughey, we have some equally good performances by Matthew Fox (Lost) as Red Dawson and Anthony Mackie as Nate Ruffin who just make the film even more relatable. Apart from a well-written story, McConaughey is the star of the movie and shines throughout the movie and showcases what a powerful actor he is. It's a shame that more roles like this haven't come his way. On Blu-ray, the video quality is good with bright colours, sharp images and glorious widescreen. Add in Dolby TrueHD which sounds phenomenal at certain times in the movie plus some interesting special features and this is one enjoyed presentation.